Home / Forums / Software Testing Discussions / Should this Testing Book be Banned from California Prisons? 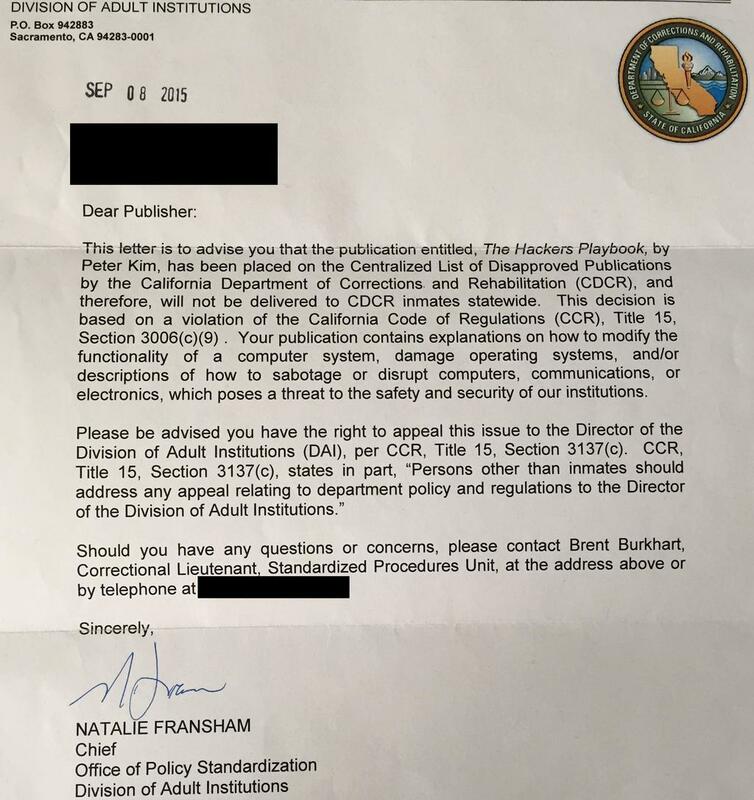 Should this Testing Book be Banned from California Prisons? I cam across this letter online and thought it was entertaining. Do the prisons have a valid point or are they blowing things out of proportion? I want to hear your views. Wuuf. Need to think about this one. It’s funny. I was only thinking a few days ago that it might be nice to cut off from all distractions for a year or two and really study hard without interruptions. Tens of thousands of pages have been written about security and it’s mainly dry technical material that’s hard to concentrate on when the next ‘Game of Thrones’ episode is an alternative. The trouble is, anyone studying hacking in prison has already established a reputation for dishonesty and is less likely than the average person to gain or maintain honest employment after serving their time. That may be unfair, especially if someone has fallen foul of unreasonable laws against legitimate security research, but it seems to be a reality. The criminal underworld fueled by Bitcoin fees and ransoms is now better organized than some legitimate enterprises. There is a specialized supply chain of passive and active scanning for vulnerabilities, crafting exploits, preparing attacks, committing the penetration and exfiltration, then selling the sensitive data onward perhaps to street criminal who will be monitored to ensure they pay the correct commission for their card frauds etc. Unlike honest business, a criminal history could be a positive asset for a skilled hacker entering the ‘dark web’ marketplace (and breaches due to hacking are growing 100% per year according to recent Verizon research). On balance I’d have to support the ban on hacking books in prison because I suspect the knowledge is more likely to be misused than not. Initially I found this letter amusing as I thought it was greatly overreacting but the more I think about it, the more my opinion changes. Here’s a thought. You mentioned that hackers in prison will not find honest employment upon release. Would a book like this in the public domain not influence non-offenders to begin hacking and therefore increase their chances of joining the rank of criminals in these prisons? If that were the case, would banning these books altogether be a better approach than just keeping them away from convicted criminals? And exactly how would this work when they get out? How are you going to keep knowledge from them and abide by the US constitution? Could it possibly be more advisible to guide them to use the techniques they are going to learn anyway (if they have the interest and have the brains) in a productive manner?